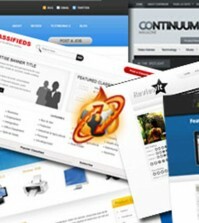 This new link monetization company launched just days ago with venture capital backing from Google. 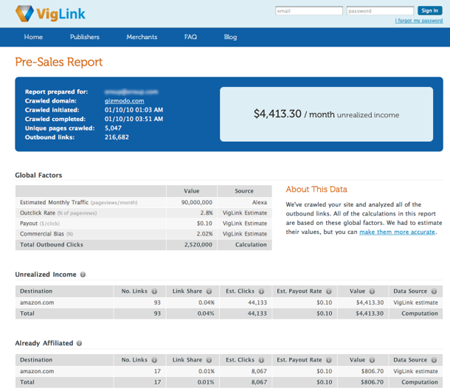 VigLink aims to provide affiliate earnings to bloggers by automatically detecting outbound links that lead to retailers who provide commissions on sales. A standard link to any one of thousands of retailers or individual products can be detected by VigLink and once clicked, affiliate tracking information is added dynamically. You earn the commission and VigLink takes a percentage for their wizardry. Publishers can request a free pre-sales report which analyzes outbound links and uses several estimates to determine potential earnings. In the example report above, popular blog Gizmodo could potentially earn $4,413 per month with VigLink. VigLink’s CEO Oliver Roup has hinted that their open API can already be connected to social services. I believe VigLink will be able to tap into massive social networks where people are sharing links to products constantly. The major hurdle will be making deals with the likes of Twitter and Facebook. If this doesn’t spark an online business boom, I don’t know what would. I look forward to watching what happens as the company evolves and will likely be joining in myself as this may be a way to circumvent Amazon’s recent ban of North Carolina affiliates. What are your thoughts? How did your pre-sales report turn out? Please leave a comment below.